The issue amount of electronic money in Japan is 130,000,000, which is little more than Japanese population. 70 % of Electronic Money is used at supermarkets and convenience stores. It’s also popular to be used as transportation tickets. In addition to the major stores, there are other services started adopting electronic money, even at traditional temples. 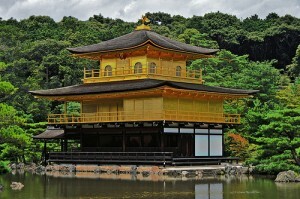 The famous Kinkaku-ji (The Gold Pavilion Temple) in Kyoto accept electronic money for admission fee.